Daily Illuminator: Futuristic Weapons, On The Tables! October 25, 2014: Futuristic Weapons, On The Tables! If you're a science-fiction GURPS gamer, you need GURPS Ultra-Tech. But sometimes you're in a hurry, and all you need are the stats. Wouldn't it be great if all those weapons were just a download away, in a ready-to-use PDF? Now they are, thanks to GURPS Ultra-Tech: Weapon Tables. This supplement includes just the weapon tables from Ultra-Tech. Flip through its virtual pages (or print 'em out -- PDFs are awesome!) to quickly find stats on tactical disruptors, blaster cannons, gravitonic railguns, and much more. Arming those near-future heroes or evil space pirates has never been easier. 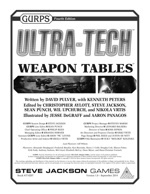 And thanks to the magic of PDF, everyone who purchased the digital version of Ultra-Tech from their Warehouse 23 account can also get these Weapon Tables absolutely free; just redownload Ultra-Tech and find the new PDF nestled in the ZIP file. And if you bought the print version of Ultra-Tech, the Weapon Tables download is a very affordable addition to your library . . . and a great way to try out Warehouse 23's digital files! The future is here, and it's cooler than ever!